This photo probably looks pretty familiar. We posted another nose shot of Astrid's a couple weeks ago, nearly identical to this one. But, believe it or not, that photo and this one were not even taken in the same sitting, let alone on the same day. Astrid loves to pout for the camera, and so her photos all always seem nearly identical. I get plenty of pouty puppy poses out of her, with the occasional nose shots like this one, and that's often about it. Did you know, though, that Astrid is actually a very lively dog who spends roughly 99% of her time smiling? You'd never know that from her melancholy photo shoots. That all being said, I am on a mission to get some shots of the true Astrid. I want you all to see her smiley and goofy self, rather than just the pouty puppy side of her. If I succeed on this mission, I will of course share the results with you all here on our blog. Wish me luck. Did you know that today is Inspire Your Heart with Art Day? We think that is a mighty fine celebration, and Astrid helped me doodle something up in its honor. We've been giving tips on household safety over the past few days, and we're going to finish this series off by heading outdoors. In other words, just as as there can be dangers inside the home, there can also of course be ones outside as well. For furbabies who go outdoors, be aware of what all out there might pose a risk to their health and safety, and take all precautions necessary. For example, if your pup or kitty is in your own yard with you as grill or enjoy your fire pit, of course keep them away from the fire and heat, as you certainly already know. Also, of course, be aware that smoke, embers, and ash can all also be dangerous. There are those risks that might be found in your garden, such as from poisonous plants or fertilizers. Especially if you have toxic plants, be sure to block your furbaby's access to the garden, or at least monitor them at all times when in the yard. Even food you leave out for birds or squirrels could lead to issues, as sometimes can the excrement and other debris left behind by wildlife. So, try to keep feeders for the birds and squirrels in areas where your furbaby cannot easily reach. All in all, potentially dangerous situations will depend on your particular home, yard, and what can be found within, so always be aware of this and of course do all that you can to ensure your furbaby's health and safety. Can any of you guess whose toesies you will be seeing today? Would you believe us if we told you it's none other than the elusive Eddy? That's right, believe it or not. Of course, it wouldn't be an Eddy shot if there wasn't some semblance of blurriness involved. She rarely disappoints in this regard. That all being said, I had a proud momma moment with Eddy the other day. See that long nail she has in that there photo? Eddy's nails are not the easiest to trim, you could say. Don't get me wrong, though, because this girl is not even the least bit aggressive during nail trims. She will actually let me trim her nails when she's sleeping. But, that's easier said than done when the kitty at hand is also a light sleeper who only takes speed naps. She is usually only asleep and immobile long enough to get something like one nail trimmed at a time. I'm rambling, though. Where I'm going with this is that the other day, for the first time ever, Eddy let me trim her nails while my sister held her. My sister is just about the only other person in the world besides myself who gets to see Eddy on a regular basis. Since my sister lives with us, Eddy accepts her existence. But, Eddy allowing my sister to hold her is a whole other story. Nevertheless, the other day my sister scooped her up, Eddy froze, and then sat still like that while I trimmed all 18 of her nails. That made this momma proud. Some days, that's all it takes. Wasn't that a riveting story? Nothing like a real nail-biter to get your day started. Well, anyway, we're wishing you all a terrific Tuesday! Our 2018 Blogging Cats Weekly Planner informed us that today is Croissant Day. Obviously, that had to be celebrated in our doodle for the day. One of our final household safety tips is about some of the dangers that might be found in your office, study, or other similar area in your home. One of these potential dangers is none other than a shredder. Especially if you have a shredder set to automatic shredding, a curious paw or even tongue could potentially be injured if they find their way to the shredder. So, if you have a shredder, do be sure to keep it off, unplugged, or hidden away when not in use. Another item that could potentially be dangerous is those scissors. The main danger here is of course the sharpness of them, so to keep your furbaby safe, keep all scissors closed, concealed, or hidden away. Also don't forget about small office items, or any items around the house, that could be a choking hazard, or that could lead to bowel perforation or obstruction. For example, paperclips might be tempting items for a kitty's curious paws or for a pup who likes to pick things up in their mouth. Even simple pens and pencils could be dangerous, especially if you have a kitty or pup who is a chewer. So, do be sure to keep all small items safely tucked away in a drawer or other container. The moral of the story is to consider all the items you have in your house and what dangers they might pose to your furbaby, and then plan accordingly. Today is Mancat Monday, and our housemate Toby insisted on being our mancat of the day. You got to see a doodle of him for our contribution to the Caturday Art blog hop this past weekend, but he wants you all to see the real deal today. So, here is a dose of Toby for you. Unfortunately, Toby couldn't manage to look at the camera. He simply had too good of a view out the window on this unseasonably warm day. Can you really blame him? 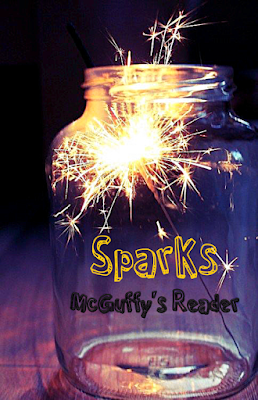 Speaking of views, that has a little to do with our positive thought for today's Sparks blog hop, which is hosted by Annie of McGuffy's Reader. 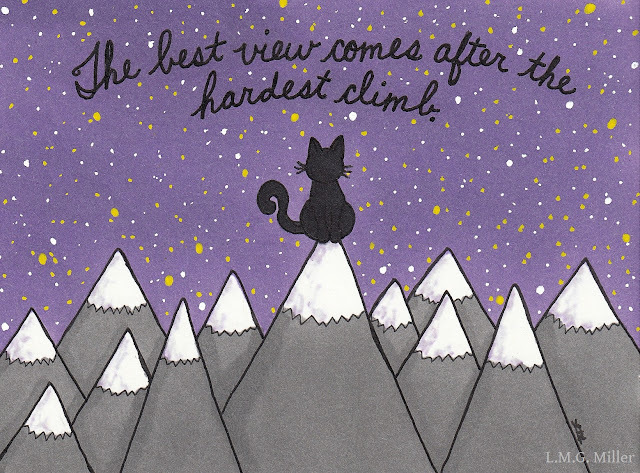 Though we hope none of you have steep hills in life to climb, if you do, we hope the view from up there is beautiful. A happy and blessed Monday to all! Continuing on with our household safety tips, today is perhaps an obvious one. And that is, to always be careful and cautious with areas such as windows and doors. When it comes to windows, ensure that screens are safe and secure before allowing your furbaby to enjoy the view, and monitor them while they enjoy an open window. An obvious tip for the doors in your house is of course to ensure that your kitty or pup cannot easily escape outside, such as by keeping them in another area of the house when there is foot traffic in and out of the house. Another tip related to doors, though, is to be aware of paws, tails, heads, and their overall location when you open and close any doors in the home. Paws and tails, for example, can be easily injured if a door is shut on them. Also be aware that injuries can occur not only where the door closes, but also in the crack by the hinges, such as if a paw or tail pokes through there when the door is closing. All in all, always try to keep your furbaby safe from the dangers that any entryway might pose, whether it be a window, a door leading outdoors, or even something as simple as a closet door. Of course, Evan snapped these snuggly selfies for the Sunday Selfies blog hop, hosted by our Kitties Blue pals over at The Cat on My Head. That's not all this momma's boy has in store for you today. But, he'll take it from here. Hi, friends! Like my mom said, it's me Evan. Some of you probably already know that, for the past couple of days, all of us furbabies here have been answering some fun questions that none other than CK shared on her blog recently. I've been waiting for my turn to answer them, and today is finally the day. I tried to keep these as short as possible, which is tough, because I really do love to talk. Anyway, I hope you enjoy learning more about me! 1. What was the last thing you put in your mouth? Coconut oil. Yum! My mom uses it all the time when cooking, and I always chase her around the kitchen and scream at her until she gives me a lick (or two, or three). 2. Where was your header pic taken? Mommy doodled it up in her sketchbook while sitting next to me on the couch. I love sitting on the couch with my mommy. 3. Worst pain you ever felt? Well, I was paralyzed by a coyote when I was 6 weeks old, and that didn't feel great. Don't worry, though, I don't remember it much, and I soon after met my mommy. So, I'd say everything happens for a reason. Besides, I still run and play just fine. I own that hind limb paralysis! 4. Favorite place you've traveled? Doesn't traveling mean the PTU? I don't like the PTU. When I have to go in the PTU, I, um, pee and poo myself. 5. How late did you stay up last night? However late my mommy stayed up. I don't care what time it is, I always go to bed when Mommy does. 6. If you could move, where to? I'd rather not. I like my home. That, and I don't want to get in that PTU. 7. What do you collect? Toby's fur. He and I wrestle all the time, and I always take some of his fur with me. Mom says I'm too rough, but I say Toby likes it. 8. Which of your blogging friends lives the closest? Laila and Minchie are close! 9. Amusement park or concert? I put on concerts for my mom all the time. She calls me Chatty Cathy. Is that my band name? 10. When was the last time you cried? See #1. The squeaky wheel gets the oil, after all. 11. Who took your header photo? Mommy drew it. 12. Who's the last person you took a photo with? Toby. Not by choice, though. He is the ultimate photobomber. 13. What's your favorite season? Um, winter? My mom stays indoors more when it's cold, and mommy time is the best time ever. 14. If you could have any career, what would it be? I'm already my mom's manager. 15. Do you think relationships are ever worth it? Of course! Especially the one I have with my mommy. 16. If you could talk to anyone right now, who would it be? Mommy! In fact, I'll go talk to her right now. 17. Are you a good influence? Yes, if I do say so myself. 18. Does pineapple belong on pizza? As long as I get a bite of cheese, you can put whatever you want on the pizza. 19. You have the remote, what are you watching? If the TV's on, I'm happily dreaming on the couch or in bed next to Mommy. She can have the remote, as long as it makes her stay put. 20. Whom do you think will play along? Hopefully some of you friends of ours! Did I do good? I hope so. Oh, and I asked my mom to doodle something just for me today. So, here it is! My mom calls that my "come-hither" pose. I don't care what she calls it, as long as it lures her in. I hope you all have the most stupendous, spectacular Sunday ever! Today's household safety tip involves none other than the bathroom. The bathroom can harbor a great many dangerous to our furbabies if we are not careful. We already recently mentioned in a previous tip keeping your furbaby safe from water, such as that in a full sink or tub. Also be sure that your furbaby does not try to play with hot running water, as that could lead to burns. Another source of water is of course the toilet. This can be not only a dangerous place to land for a kitty or pup, but can also be hazardous if you've recently cleaned the toilet with a cleaner. In this case, it is likely not ideal for them to drink the water or to get the water on their fur or coat. So, keep that toilet lid down! The dangers of the bathroom continue on, though, and can include items such as razors, hair pins, and of course the contents of the medicine cabinet. Always be aware of what is in your your bathroom, where you store items in your bathroom, and how that can affect your furbaby. To avoid emergencies, do your absolute best to keep all dangerous items or areas of the bathroom blocked from your furbaby's reach. We have a couple of things to share with you all today. First, we are of course participating in Athena's always fun Caturday Art blog hop. Our doodle for today stars none other than Toby. It's a random one, but it will make a bit more sense once you've read the rest of this post. Well, at least we hope it will. For those who don't know or might not remember, Toby lives at our house, but he is not, in fact, my cat. He is my sister's cat, and my sister lives with me. Therefore, Toby lives with us, too. He is one cool, chill cat. Most of the time. He also just so happens to be one of Thimble's litter mates. Oh, and just to clarify, I do indeed consider myself Toby's "auntie". Because, well, I sort of am. That all being said, Toby is now taking over this post. Hi, guys! I'm Toby. I think my auntie just told you that. I'll tell you again, though, in case you already forgot. I'm Toby. Okay, so, I'm here today because my auntie told me that our friend Stunning CK shared some fun questions she answered, and then invited all of her friends to answer them as well. All of us furbabies here are taking turns answering them, and today it's my turn. 1. What was the last thing you put in your mouth? Spinach. I'm always stealing spinach from my auntie. I don't eat it, because that would be gross, but I do carry it around the house. 2. Where was your header pic taken? It's somewhere in my auntie's sketchbook. 3. Worst pain you ever felt? Um, when the V-E-T took my boy bits? 4. Favorite place you've traveled? Well, I'm not a huge fan of getting in the car, so, do I have to answer this? 5. How late did you stay up last night? I stayed up just long enough to empty all the food bowls. 6. If you could move, where to? Do I have to move? That sounds like an awful lot of work. 7. What do you collect? I love to pile up my toy mousies. I don't like when the other kitties touch them. 8. Which of your blogging friends lives the closest? I'm told that Laila and Minchie are not too far from us! 9. Amusement park or concert? Hmm, they both sound kind of loud and busy. I'm not really into loud and busy. 10. When was the last time you cried? Yesterday, when I wanted someone to play with me. My auntie says my cry is more like a squeak, and she laughed at me. That's okay, though, because I at least got my way. I made her throw toy mousies while I lied down and watched. 11. Who took your header photo? My auntie doodled it. 12. Who's the last person you took a photo with? Pup Astrid. I love cuddling up to her and forcing her to take photos with me. 13. What's your favorite season? Well, I do like to play with leaves that end up in the house. So, autumn? 14. If you could have any career, what would it be? Astrid told me she put couch potato for this. I think that sounds wonderful. 15. Do you think relationships are ever worth it? Sure! I have lots of lady loves in my life, like my mom, my auntie, and pup Astrid. 16. If you could talk to anyone right now, who would it be? Um, my mom? Or, maybe my auntie? Do I have to pick between the two? I can't. That's too tough of a decision. 17. Are you a good influence? Yes? 18. Does pineapple belong on pizza? The only fruit I like is strawberry. I love me some strawberry. 19. You have the remote, what are you watching? Let's just turn off the TV, so that everyone can admire me. 20. Whom do you think will play along? Well, Evan is answering these questions tomorrow. Yeah, that's my answer. So, does my auntie's doodle of me for today make a bit more sense now? She said she felt a bit silly making that illustration, though, apparently because I don't even actually eat my favorite human foods, but instead just like to roll in them and throw them around the house. But, whatever floats my boat, right? 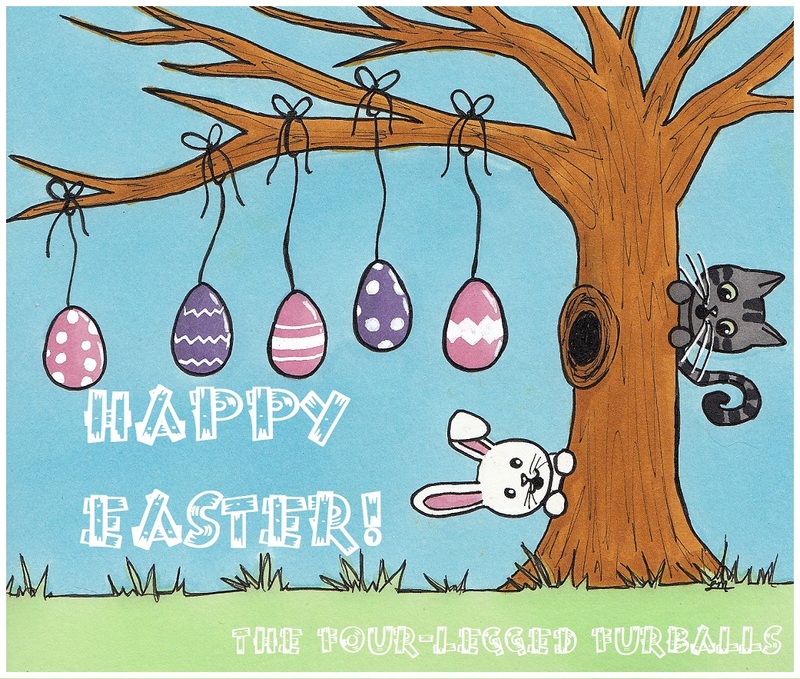 We hope you all have a fantastic Caturday! Can you believe that we have yet another kitchen safety tip for you all today? This one is for those who have a dishwasher. First and foremost, just as with the dryer and washer, keep an eye on your furbaby and the dishwasher when it is open. Before you close the dishwasher, always make sure that no kitties or even small pups have made their way inside. Getting closed in the dishwasher is not the only risk, though. Dirty plates inside the dishwasher could contain crumbs of potentially dangerous foods or drinks, such as onion, garlic, chocolate, and alcohol, which could of course lead to danger if your kitty or pup tries to clean off the dishes themselves. Other dangers that could be found within the dishwasher include knives, forks and their sharp tines, and glass. Long story short, the dishwasher, though seemingly harmless, could be a source of danger for our kitties and pups. Be aware of these dangers, and monitor your furbaby around the dishwasher accordingly. As we always do, we will start this Friday off with the always fun Friendly Fill-Ins challenge, which is of course hosted by our friends Ellen of 15andmeowing and Annie of McGuffy's Reader. 1. The flu shot _________. 2. I think everyone should take _________ daily. 3. I (almost) always _________, because _________. 4. I (almost) never _________, because _________. 1. The flu shot did not help my mom this year. 2. I think everyone should take time to herself/himself daily. 3. I (almost) always wake up to kitty cuddles, because Thimble is a cuddle bug. 4. I (almost) never skip breakfast, because it's the most important meal of the day. Hello, friends! It's me, Eddy! It's finally my turn to take over this post. Now, those of you who have been visiting us lately might know that all of us furbabies here are taking turns answering some fun questions that Stunning CK posted on her blog not long ago. Today is my turn. So, if you want to learn more about me, read on! 1. What was the last thing you put in your mouth? Fish food. My mom fed the fish, so of course I stole some. 2. Where was your header pic taken? My mom drew it. I tried to take her markers so that I could play with them, but she was a killjoy. 4. Favorite place you've traveled? No, no, no. The PTU is the devil. 5. How late did you stay up last night? I only take speed naps. 6. If you could move, where to? No, no, and no again. If a PTU is in any way involved, I'm out. 7. What do you collect? My mom's watches. She's had to buy 3 new ones since she adopted me, because I swipe them when she's not looking. I take them up into the box-spring of her bed, where I created a cave in which to stash all of my loot. 8. Which of your blogging friends lives the closest? Laila and Minchie are only a couple of hours away. 9. Amusement park or concert? I turn anything and everything into an amusement park. I also like to put on concerts for my mom, though. I really like to talk to her. 10. When was the last time you cried? Last night, when I could see the bottom of my food bowl. 11. Who took your header photo? My mom used her (really fun to steal) markers to make it. 12. Who's the last person you took a photo with? MOL! That's funny. Let's go with no one, because I don't allow many photos of me to be snapped. 13. What's your favorite season? I'll happily stare out the window no matter the season. 14. If you could have any career, what would it be? My mom says I'm a proper kleptomaniac, so let's go with that. 15. Do you think relationships are ever worth it? Only the one I have with my mom (no one else is allowed to touch me, let alone see me). Oh, and I do love my fursibs, especially Evan. 16. If you could talk to anyone right now, who would it be? My mommy! I don't like when she leaves for work. 17. Are you a good influence? I could teach you all kinds of skills! 18. Does pineapple belong on pizza? I wouldn't know. I refuse to eat anything but my favorite dry kitty food. And fish food, of course. 19. You have the remote, what are you watching? My fish aquarium. Someone else can have the remote. 20. Whom do you think will play along? I'm told our housemate Toby is answering these tomorrow, so can he by my answer? Remember how in #12 up there I said that I don't allow many photos of me to be snapped? Well, sometimes my mom steals photos of me anyway. This is one of those stolen shots. It's all blurry and blue-toned, but that's what my mom gets for stealing a shot of me. 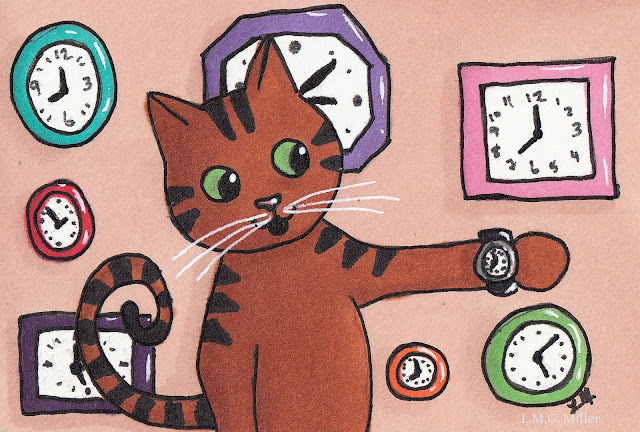 Oh, and speaking of stealing, my mom doodled a drawing of me and titled it "Time Thief". Isn't that rude? Just because I swipe her watches (see #7 in my questionnaire above) doesn't mean I'm a thief. Right? Well, anyway, happy Friday to all of you! We thought we were all done with kitchen safety tips, but we actually have at least one more for you. Today's kitchen tip is to be aware of how safe your appliances are for your furbaby. For example, do you have a toaster as well as a furbaby with extra curious paws? A toaster that is in use can cause burns to a furbaby if they stick their paw inside, or even possibly if they get too close to it. Burns can also be caused coffee makers, as well as popcorn makers or anything else that requires heat for use. If you use any such appliances, do be sure to monitor them and your furbaby when they are in use. If need be, unplug appliances when not in use, or even stash away those that are small, if that is needed for optimum safety for your furbaby. Such safety precauions might be necessary, for example, if you are concerned that your kitty or pup could accidentally push the toaster levers or start the coffee maker when you are not supervising them. We'll say it again—it's better to be safe than sorry! Thursday is one of our seven favorite days of the week. And there are a lot of reasons for that. One is that it's the day of the Thoroughly Poetic Thursday challenge, hosted by the always fantastic Angel Sammy and Teddy. My mind ran a little rampant on this one. I ended up with a bit of a random and rambling and ridiculously long poem, which you can read below. Once upon a time, there was a boy named Arlo. His mother asked what he wanted for his sixth birthday tomorrow. A dog for a best friend was Arlo's only request. He knew a puppy's love would come without protest. And Arlo's mother said she had for him a surprise. "Let us take a short trip," his mother did say. And so into the car Arlo hopped without delay. They arrived at a building labeled SHELTER. Arlo spelled that out and knew their destination could not be sweller. All adorable and cute and not a one did Arlo want to pass up. He wished he could take each and every one of them home. But then Arlo saw one little mutt who looked most sad and alone. Over to this pup's cage Arlo did wander. But the poor pup merely stayed in its sad little corner. ALFIE was the name displayed on his cage. And, just like Arlo, six was his age. "What's the matter, boy?" Arlo asked. A sad little glance was all that Alfie did cast. Arlo wondered, "How many times have you been passed?" Arlo wished to know why this sweet pup might be seen as an outcast. And saw something that was quite a surprise. Alfie had but only three legs. Arlo gasped, "Is that why people turn their heads?" "But look here, boy, we're one in the same!" Arlo revealed that he, too, had only one leg on which to stride. And with a wag of his tail he took a step foward. "Alfie, boy, you're coming home with me,"
Arlo did tell him with boundless glee. But that was only just this story's beginning. Arlo and Alfie filled every second thereafter with much fun and grinning. They every day went on adventures most astounding. Where Alfie reigned with Arlo his wingman. Arlo and Alfie set out to rid a dragon of its spoils. And together that great dragon they did battle and fight. They conquered each and every land of their little world. And it was then that Arlo and Alfie would take on a different roll. And together bad guys they would stop. But of course they only stole with a great deal of honor. Where mighty pirates together they would be. Sailing here and there to find stolen treasure with which to abscond. At the end of the day, to land they would return. And for their next adventure they would already yearn. And during their adventures they learned what in life was truly key. It does not matter if you have one leg or three. It matters what's inside, not what you see. Hello, furry friends! It's me Thimble here now. Yesterday, pup Astrid did a fun little questionnaire that none other than Stunning CK shared on her blog. Today, it's my turn to answer them. So, now you'll get to learn more about me. Enjoy! 1. What was the last thing you put in your mouth? Ham baby food - my favorite treat! 2. Where was your header pic taken? I helped my mom draw it in her sketchbook. She needs all the help she can get. 3. Worst pain you ever felt? I had a UTI last year that hurt so bad I wanted to hide even from my mommy. I'm all better now! 4. Favorite place you've traveled? Traveling means the PTU, so no thank you. 5. How late did you stay up last night? I took a nap from 10 pm to 3 am, and drowned my mommy in cuddles before and after that. 6. If you could move, where to? Nowhere, thank you. I love my home. 7. What do you collect? Toys. I store them beneath the couch. 8. Which of your blogging friends lives the closest? Laila and Minchie live pretty close to us! 9. Amusement park or concert? I like to turn our house into an amusement park every evening. 10. When was the last time you cried? I cried at the living room wall last night. I do that every night. It confuses my mommy, and that's funny. 11. Who took your header photo? Remember #2? My mom's hand scribbled it up, with my help. 12. Who's the last person you took a photo with? I prefer to be photographed alone, thank you. A model should always be the one and only star of her photos. 13. What's your favorite season? As long the reception for Squirrel TV is good, I don't care what season it is. 14. If you could have any career, what would it be? I'm already a professional model. 15. Do you think relationships are ever worth it? I love my mommy. She does my bidding, just as I trained her to do. So, yes! 16. If you could talk to anyone right now, who would it be? I'm not much of a talker. Except, see #10 above. 17. Are you a good influence? Of course I am! Just look at me! 18. Does pineapple belong on pizza? I don't like pizza. Actually, I don't like any human food. Except baby food. And flour. I will eat flour. 19. You have the remote, what are you watching? I don't care what channel it's on, as long as I get the front row seat. 20. Whom do you think will play along? Whoever wants to! Eddy is answering these questions tomorrow here on my our blog. Oh, and since I reminded you all of what a wonderful model I am, here are some gorgeous shots from my most recent photo shoot. See? Don't I have the whole posing and adorable face thing down purrfectly? 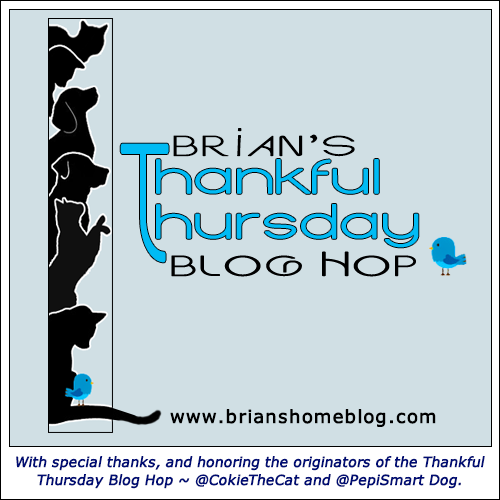 Now that you've gotten to see my cute face, I want to say what all I'm thankful for as part of Brian's Thankful Thursday Blog Hop. All of us here really are grateful for so much. First, we are thankful for friends like CK who give us fun things to do, like the fun questionnaire I did above. We are also of course beyond thankful for friends like Brian, who gives us this wonderful blog hop of thankfulness each week. And, we hope it goes without saying that we are so, so thankful for each and every one of you! We hope you enjoyed our post today, and we're wishing you all a terrific Thursday! Our last two tips have revolved around the kitchen, and today we want to give you another obvious yet also very important one. And that is, please do be sure to keep potentially dangerous kitchen utensils out of your furbaby's reach. For example, try to keep all knives and other similarly sharp objects off of the counters, or at least in a portion of the kitchen where your kitty or pup cannot reach. Even if the knives are in a knife holder, it is possible for them to be knocked loose or otherwise removed, such as by curious paws. This could obviously lead to potential injuries. If you instead keep your knives in a drawer or cabinet, of course be sure that your furbaby is unable to open that drawer or cabinet. And of course, as you surely know, never leave a knife that's in use on the counter unattended. Even knives drying in the drainer could be dangerous for furbabies who might end up on the counter and nearby. Long story short, always be cognizant of where you place or store potentially dangerous items, and ensure your furbaby's safety. 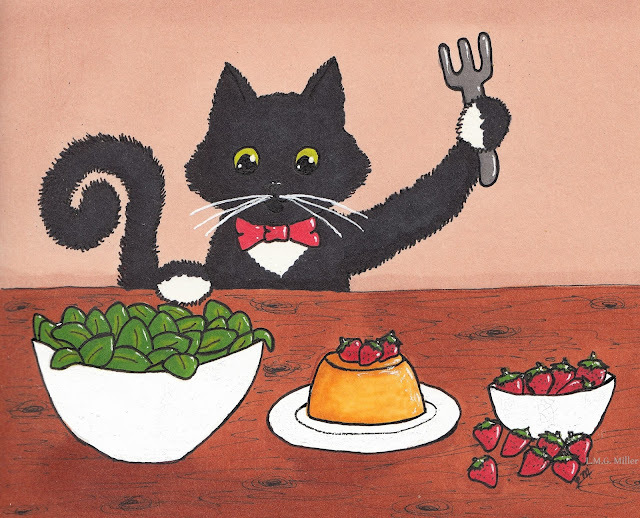 You can tuck away knives and other similar utensils in safe places, or you can make the kitchen or portions of it off limits to your kitty or pup. Whatever it takes, keep your furbaby safe! Hi, friends! What's up? It's me, pup Astrid! First of all, can you believe how my mom makes me pose and wait for my treats like that? She made me wait a whole 3 seconds for that one up there. Bogus! Anyway, I haven't gotten to take full control of this blog in a long, long time. That's bogus, too! But, I'm remedying that today. Anyway, if you'd like to learn a little more about me, keep reading! 3. Worst pain you ever felt? I hated how the sutures felt after my toe was removed last year. I overheard my incredibly rude humans making fun of me for reacting more to those sutures than to those I got after having my abdomen cut open for my spay. Whatever, humans. 4. Favorite place you've traveled? I like when my mom drives through the bank with me. They give me treats there. 5. How late did you stay up last night? I zonked out somewhere around 9 pm. I need my beauty sleep. 6. If you could move, where to? I think I'd rather just stay put. Sometimes, when we travel, I have to tell my mom when it's time to go home by demanding to go out to the car. 8. Which of your blogging friends lives the closest? I'm not positive, but I do know that Laila and Minchie live just a couple hours away. 9. Amusement park or concert? Um, neither? My mom says I'm an agoraphobe. 10. When was the last time you cried? When my mom wouldn't let me have a second treat before bed last night. I yelped at her, but she seems to think just one giant bone is enough. It's not. 11. Who took your header photo? My mom's hand scribbled it up. See #2. 12. Who's the last person you took a photo with? Toby. Not my idea. 14. If you could have any career, what would it be? Can I just be a professional couch potato? 15. Do you think relationships are ever worth it? That depends on whom it's with, and if they obey me. My grandpa and I have a great relationship, because I have him well-trained. 16. If you could talk to anyone right now, who would it be? My grandpa! He adores me, the good boy he is. 17. Are you a good influence? Duh! 18. Does pineapple belong on pizza? Yuck! I hate fruit. I also hate veggies. Oh, and bread is nasty, too. I will eat the cheese on the pizza, though. 19. You have the remote, what are you watching? The back of my eyelids. TV is so boring. 20. Whom do you think will play along? Thimble will be answering these tomorrow. Does she count? Like I said in that last answer there, if you want to know how Thimble answered these questions, pop by to visit us tomorrow! Thimble's answers won't be as good as mine, but you're free to humor her. Yesterday we gave a tip on keeping your furbaby safe around an open, hot oven. Today, we have a very similar tip, and that is to take any necessary precautions to keep your furbabies safe with regard to the stove top as well. You can begin this by doing your best to train your kitties and pups to remain off of the counters. You can train them by removing them from the counter when they get up there, by placing them on an alternative and pet-friendly surface instead, and by giving them positive reinforcement when they obey. Despite all of our best efforts and intentions, though, there is still always the chance that a furbaby could end up on the stove top, though. In case this does happen, do your best to make sure the area is as safe for them as possible. Are the knobs that control your stove easily manipulated, such as by a furbaby's curious paws? If so, consider placing covers over the knobs. There are covers on the market that are specifically designed to cover these. In addition, you can place safe covers over the burners themselves, to offer one more level of security. If nothing else, as we mentioned yesterday, you can block your furbaby's access to the kitchen as needed to ensure their safety. Astrid is incredibly happy that it's finally her turn to do her monthly review as part of Chewy.com's Blogger Outreach Program. That's even despite the fact that, just like the kitties around here, Astrid is a very picky eater. She has flavors she loves and flavors she hates, and textures she loves and textures she hates, and morsel sizes that she loves and morsel sizes that she hates. Some days, she changes all that up and decides that she no longer likes a food that she loved just the day before. You gotta keep those humans on their toes, after all! That all being said, Astrid is just as picky with her treats as she is with her regular food. Soft and chewy is her go-to when it comes to snacks. That's why I was so happy to see that this month, she could try out the tender Blue Buffalo Blue™ Stix™ pepperoni-style dog treats. Given that bacon is one of Astrid's all-time favorite things in the whole wide world, that's the flavor we chose for her to try. Even better, pork is indeed the first ingredient in these treats. They also contain no chicken by-product meals, no corn, no wheat, no soy, and no artificial preservatives or flavors. These treats sure did sound and look like a win to me. And, given the fact that Astrid was breathing down my neck as I photographed these treats, I was thinking she might find them a win, too. So, did pup Astrid like them? This blurry photo, in case you can't tell, is indeed Astrid gobbling down these Blue Buffalo Blue™ Stix™ treats! They're her favorite flavor, favorite chewy texture, and all around well-loved by this pup. They seem to be one of her new favorite treats, and they will very likely continue to make future appearances in her diet. We hope all of you furiends of ours have a tasty Tuesday filled with lots of treats! Did you know that today is National Pie Day? Well, it is! 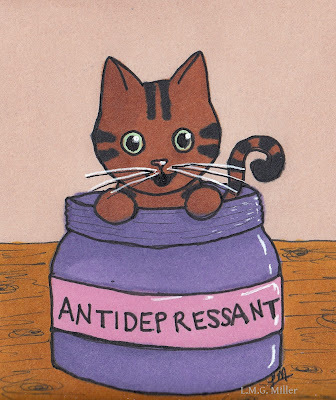 Today is one of those days when I ask you to, pretty please, not take my doodles as good advice! 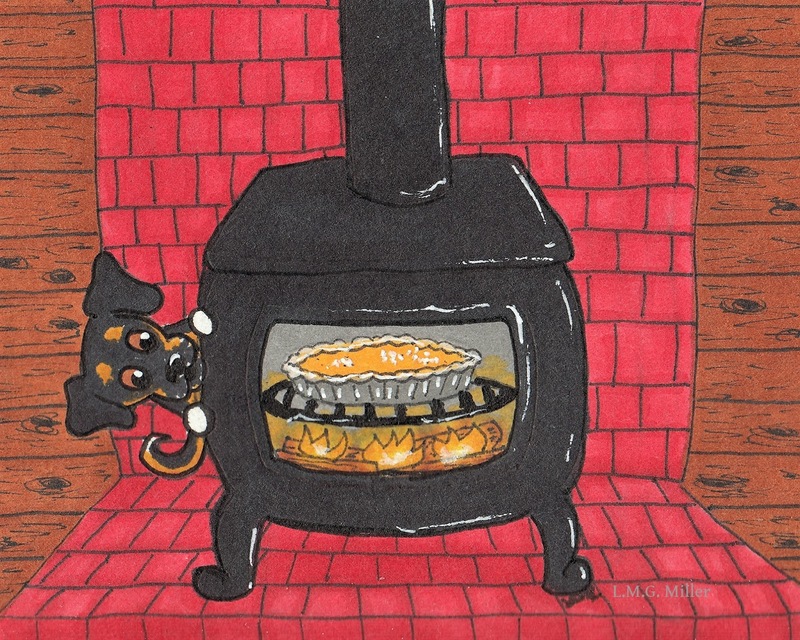 As you all certainly already know, ovens can be extremely dangerous to kitties and pups. Especially if your oven is on and at a high temperature, never leave its door open and unattended. This can lead to especially dangerous situations if you have an oven low to the ground, where a kitty or pup might be able to easily reach it. Their natural instincts would likely warn them to steer clear of a hot oven, but that is certainly no guarantee. There are also times when burns or other injury could occur before a cat or dog even realizes the danger. For example, a cat or dog prone to jumping may not notice the hot temperature before they decide to jump on an open oven door, such as one located off of the ground. So, always be aware of the proximity of your furbaby if you open the oven door. The heat can be both uncomfortable and injurious. If need be, block your kitty or pup from the kitchen while you are baking, so that no incidents can occur. As always, it's always better to be safe than sorry! Rain, rain, go away. Has anyone else been singing that these days? Our frigid and snowy weather has left us, and has been replaced by lots and lots of rain showers and mud puddles. Evan doesn't mind this so much, though, because the milder temperatures means that sometimes he gets to gaze out the screen doors. It's a cloudy and perfectly gloomy outside these days, but that hasn't gotten Evan down one bit. He gets a front row seat of Squirrel TV! As cliché as it is to discuss the weather, we're still going to ask you all what Mother Nature has been bringing you these days. So, what's the weather like in your corner of the world? We hope that, no matter what the weather is like, you're happy! 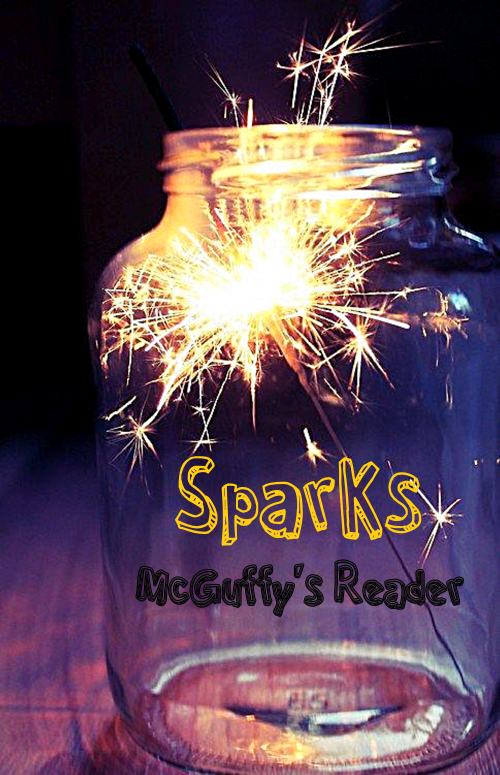 That being said, we now have a bit of an optimistic thought to share with you all today as part of the wonderfully inspiring Sparks blog hop, hosted by Annie of McGuffy's Reader. We are bringing our Sparks to you today in the form of a quick little doodle. 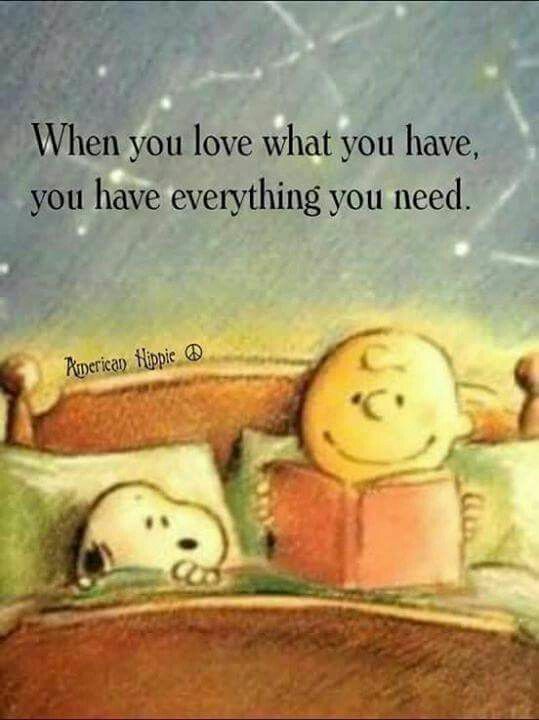 When I saw that, I decided I loved not only the quote, but also how Snoopy and Charlie Brown so simply yet sweetly represented it. So, that's where I got the idea for our Sparks sentiment, and which also heavily inspired our doodle for today. Wishing you all much happiness! Yesterday's tip was all about making sure that the contents of your purse or any travel bag is safe for your furbaby, especially in the case that you leave it somewhere they can reach it. Speaking of bags, today we are giving a reminder of the dangers that plastic as well as paper bags can pose. Plastic bags, such as those in which you bring home your groceries, can pose a number of risks. For example, if your kitty or pup plays in plastic bags and gets stuck in one, asphyxiation can occur. The handles on plastic bags can also be dangerous, such as if your furbaby gets tangled or stuck in them. Another issue is of course if your kitty or pup chews on and ingests plastic bag material, as this can lead to issues such as gastrointestinal blockage. Also don't forget the dangers that plastic bags can pose to wildlife, should one find its way to them. As for paper bags, while they may not pose as many or the all of the same risks as plastic bags, they are not completely free of dangers. For example, a furbaby getting stuck in handles or ingesting large sums of such paper can lead to dangerous situations. So, long story short, be cognizant and aware of what types of bags you use and the risks they might pose. Happy Sunday to all! 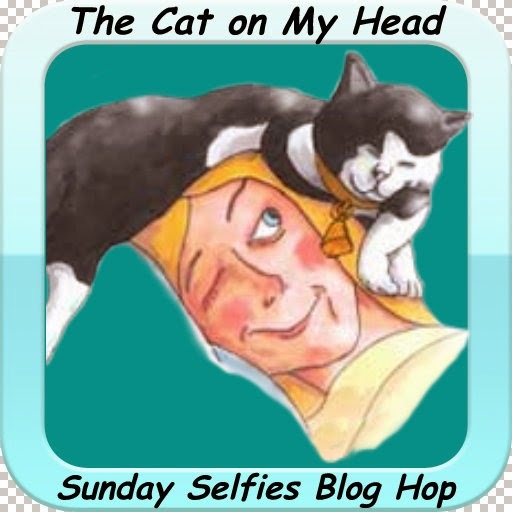 Today is of course the day of the Sunday Selfies blog hop, hosted by our good pals over at The Cat on My Head. I begged and begged the furbabies around here to please snap some snuggling, hugging selfies with each other. No one obliged. Around here, sadly, none of the furbabies really, truly cuddle each other. To be honest, the most common inter-furbaby cuddles are Toby or Thimble trying to force snuggles on pup Astrid. The other two kitties most likely to be found snuggling are Evan and Eddy. This is essentially always Eddy's doing. She loves her some Evan. But, sadly, Evan is not always all that into it. That's probably why he snapped the following selfie for today, after one of Eddy's cuddle assaults. That there selfie just about sums up Evan's thoughts on Eddy's forceful advances. He is not impressed. 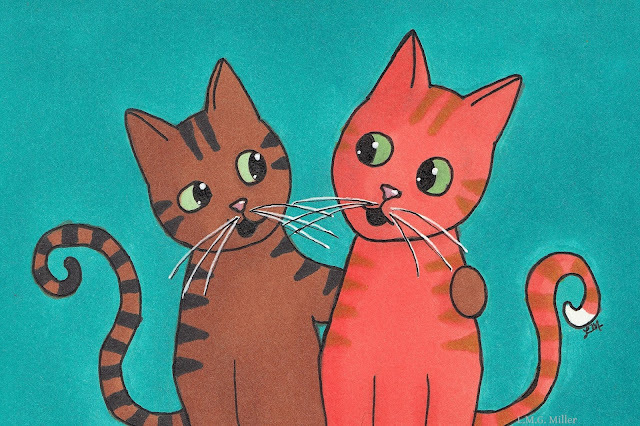 Don't forget to celebrate today with lots of hugs! Have a beautiful day! We all know how important it is to keep things like our medicine, chocolate, and other potentially dangerous goods out of the reach of our furbabies. We shut these in cabinets and drawers and make sure that our furbabies can't get to them there. But, do you ever keep any medications, food, or other potentially dangerous goods in your purse, or backpack, or other similar storage or traveling item? It might be a habit to just lie your purse or bag on the floor or counter when you get home, forgetting what might be in there. Depending on what you store in your bag, this could pose a risk to your kitty or pup. So, especially if your furbaby is known to find your purse or bag and help themselves to it, do always be cognizant of what is in there, and plan accordingly. If you take medications or food in your bag, be sure to remove these from it when you get home. Or, when you get home, hang your purse or bag in a closet or somewhere else that your furbaby can't reach. Even items such as coins can pose a danger to our furbabies, such as if ingested. So, given what all might be found in your purse or bag, if you carry one, do be sure to always keep this in mind and be aware of how it might affect your furbaby's health and safety. The art we have to show you all today is different than our usual. No, this here human did not learn how to do digital art. Honestly, the best I can do is crop a photo and add some words in Paint. Yes, friends, I have to use the Paint program because I have no other skills with digital art. Anyway, speaking of paint, that has a lot to do with our art for today. I've mentioned on here before that I am by no means, at all, a painter. I love to doodle and draw, but I cannot paint. That's probably why I was a tad bit concerned when my cousin invited me to her bachelorette painting party. Not that I'm complaining about her style of party, though. I'm not the wild and crazy type, so painting beat the other bachelorette party options. Anyway, long story short, I actually had a great time at my cousin's paint party. The above art is indeed what I painted that day. To make the endeavor of using a paintbrush on canvas a bit easier for non-painter me, I went in knowing that I was just going to paint a redo of one of my drawings. Perhaps some of you recognize this painting as being incredibly similar to some of my drawings, because it is just that. So, painting was fun, but I think I will stick to my markers and sketchbook from here on out. They're far less stressful, at least to me. That, and cleaning up after a painting session is a bit of a drag. 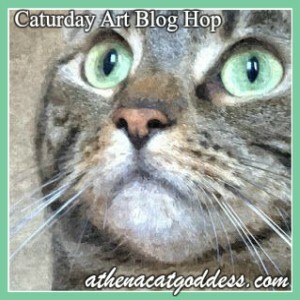 We're entering this painting into none other than Athena's Caturday Art blog hop. Do be sure to visit Athena so that you can see the art that all of our friends have created! We're certain we've mentioned this before, but today seems like a good day to repeat ourselves. Always be cautious when using paints and other similar products, such as varnish and the like, around your furbaby, as these products can be potentially toxic. Some paints contain components such as heavy metals and volatile compounds, and they can emit dangerous gases that could lead to irritation of the respiratory tract and symptoms such as dizziness. This can progress to dangerous situations, especially if exposure to paint and its fumes is unventilated and prolonged. Such dangers can exist for both furbabies and humans. If you are looking to paint, do consider researching the safest options possible, and the safest methods. Look into using paints labeled as pet-safe. Additionally, if and however possible, try to keep your furbaby away from areas where painting is occurring. What do we always say? It's better to be safe than sorry! Happy Friday, friends! 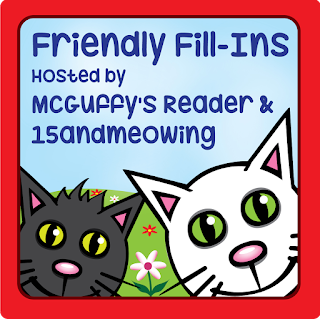 As many of you probably already know, we will now, just as always, start with the fun and fantastic Friendly Fill-Ins challenge, hosted by Ellen of 15andmeowing and Annie of McGuffy's Reader. 1. I have never been able to _________. 2. I wish I could still _________. 3. _________ is my ideal winter night. 1. I have never been able to keep a plant alive. 2. I wish I could still do gymnastics. 3. Snuggling up with my furbabies for an evening in is my ideal winter night. As with every Friday, we now have some Eddy for you! Let's preface these photos by reminding you all that Eddy is something along the lines of allergic to the camera. Taking a photo of her is a challenge at which I often fail. These photos are proof of that. Eddy was snoozing away on a pillow. She looked so cute and I asked her to please stay put for a picture. So, naturally, she started to get up. Not quite the kind of silhouette shot I usually aim for, but that's all right. Thanks, Eddy. Better luck next time, please? A very happy Friday to all of you! Ready for an incredibly random tip today? If you're ever in a pinch, you can use a shower cap as a water bowl for you furbaby. This might come in handy if you are traveling and need to grab something quick and easy to store. Of course, you have to ensure that there are no holes in the cap. But, if you can't find a bowl and simply need something out of which to give your kitty or pup some water, you can try to improvise with something such as a shower cap. Other improvisations when a bowl is not available include using a lid or even your cupped hands. Then again, to prevent the need to use such makeshift bowls, you could always keep a spare bowl in your car, in your purse, or anywhere else one might be needed. Hello, friends! We've reached another Thursday, which is a great thing, if you ask us. We'll start today with the Thoroughly Poetic Thursday challenge, hosted by Angel Sammy and Teddy. My poems may or may not make any sense at all, but I sure do have lots of fun writing them. This week was no different, and below is the poem I had fun scribbling up for the happy and colorful photo above. 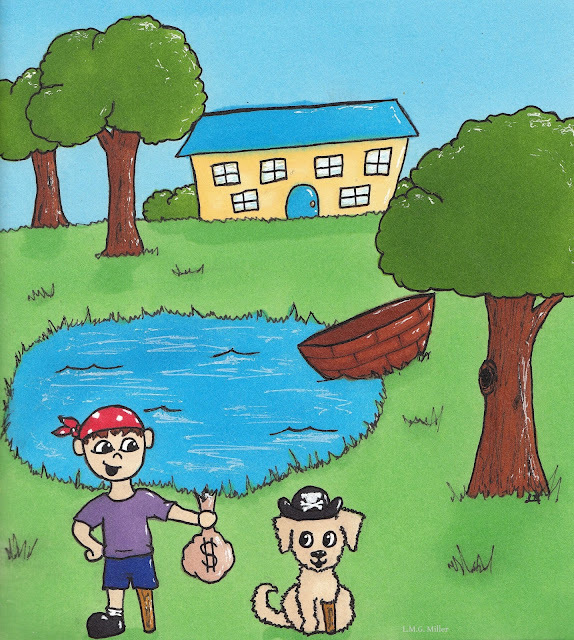 Journey Jones embarked on many adventures. There was no land to which she had not ventured. That was her very problem, though. She had no places left to go. Journey's travels had taken her near and far. She had completed a road trip in her car. And she had sailed every sea there was to sail. And in a heartbeat she would climb up that peak over yonder. In which she had nowhere new to adventure. But then a bright idea flashed in her mind. She could not believe to this thought she had been blind. When she realized that she had not yet traversed the sky. And so Journey began making her plans. This adventure would take her far off of land. Journey's excitement she could not disguise. And felt confident enough to fly to the moon. And before she knew it she was far up in the skies. With wonders far different than those of the land. And Journey felt sad to leave them behind. Until, before she knew it, she was indeed on the moon. It was quiet and peaceful on its great round surface. Journey would have been happy to stay there in earnest. For she still had a great many adventures ahead. And made a pit stop at none other than Mars. And what she found there was a lovely surprise. Spanning the whole sky, from high to low. And visited the folk of that colorful land. Until she had taken in every sight. Her next hot air balloon ride was already planned. She could not wait to return to that world way up high. Journey was born for adventures in the sky. As per usual, I doodled up a little illustration for our poem of the week. 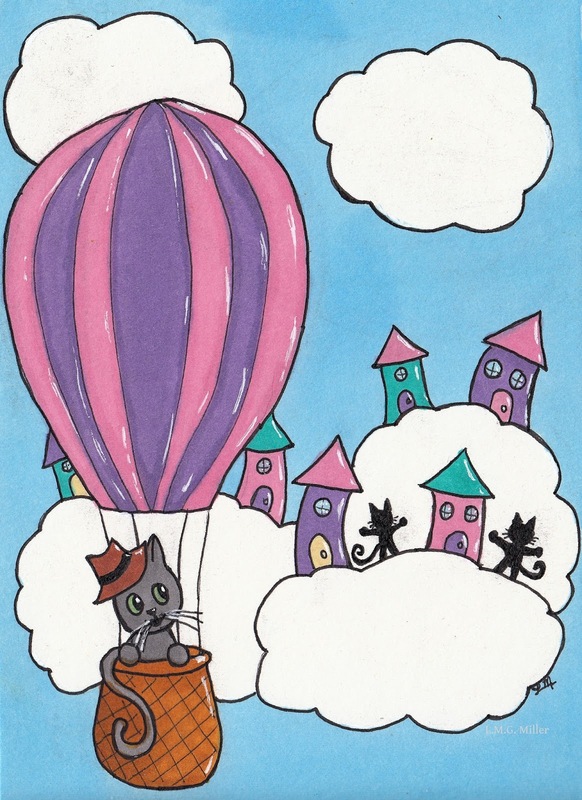 This one takes place during Journey's visit to the City of Clouds. Thimble says that's enough about hot air balloon rides, though, as it is her turn to star in this post. I work for her, so of course I must agree that she is right. We've mentioned a couple of times over the past week or so that we have a new cat tree in our house. It was a late Christmas gift for the kitties, to help them, especially Eddy, recover from the loss of their beloved Christmas trees. Thimble loves the new cat tree just as much as Eddy does. The new cat tree gives the kitties a direct view of our back yard, where we feed all of the birds and squirrels. You know what that means. Bird TV and Squirrel TV! Thimble is of course entering her gratitude for the new cat tree in Brian's Thankful Thursday Blog Hop. Do you know what else Thimble is thankful for? Her Donut Kitty has been located and is safe and sound! If you read our post from last Thursday (click here if you would like to meet Donut Kitty), you might remember that Donut Kitty had been missing for some time. I helped Thimble look under all of the furniture, but simply could not find it. Then, just a couple of days ago, Eddy reached under the china cabinet and pulled out Donut Kitty. Thanks, Eddy! And, of course, on this Thankful Thursday, we are also so very grateful for all of you. Yesterday we discussed some of the the benefits of using baking soda, such as to help deodorize your carpet and furniture. Another great asset in a home with pets is vinegar, which can serve as both a cleaner and a deodorizer. A quick and easy homemade cleaner can be made using white vinegar and water, such as in a 1:1 ratio. This can then be used for any number of purposes, such as removing carpet stains caused by pet vomit, urine, or feces. At the same time, as previously mentioned, it will also serve as a deodorizer. For a double whammy cleaner, you can mix both baking soda and vinegar together as a more potent cleaner, stain remover, and deodorizer. You can keep your vinegar mixture in a spritz bottle, and spray it onto stains or other scenes of accidents as needed. Vinegar itself can also be used to clean litter boxes. For example, once you've emptied out the litter box, you can add a layer of vinegar to the bottom of it and let it soak for a quarter of an hour or so. Then you can scrub the litter box, drain out the vinegar, and let it dry, and in the end you'll have a freshly cleaned and deodorized litter box. Of course, to be safe, do be sure to keep all such cleaners and other similar substances safely out of your furbaby's reach. Yesterday we posted a doodle of a special little version of Winnie the Pooh, in honor of tomorrow being Winnie the Pooh Day. I also mentioned at that point that, to be honest, my favorite Pooh Bear character is actually not the bear himself. I quite like myself some underdogdonkey. Fun fact? 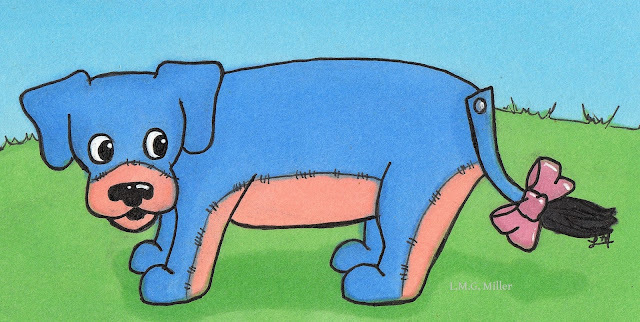 I collect Eeyore dolls. I remember the Christmas, many moons ago, when I received a jumbo Eeyore doll. I was ecstatic. It now sits on a shelf above my bed, as creepy as that sounds. Did you know that, as a pet parent, baking soda can sometimes be your best friend? Though you of course don't want your pup or kitty consuming or breathing any large amount of substances such as baking soda, it is largely pet-safe when used wisely. 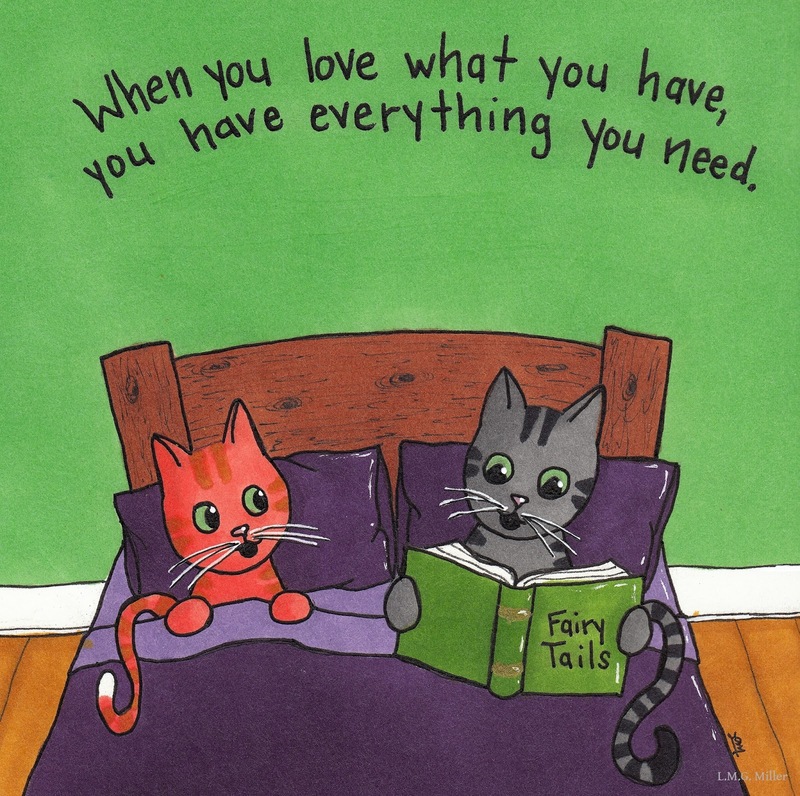 That's just one of the reasons why it can come in quite handy for those who have pets. We all love our furbabies, but we all might also perhaps admit that sometimes our furbabies don't leave things smelling their freshest. This is where baking soda can offer a bit of help, as it can work wonderfully as a deodorizer, as it can absorb smells like those related to our furbabies. One way to take advantage of this is to sprinkle some on your carpet or furniture, let it sit for roughly 10 or 20 minutes, vacuum it up, and thereby leave your floor and furniture smelling more fresh and clean. You can also do this in your car, such as if your pup or kitty takes a trip in there often and perhaps leaves it smelling a little, well, furry. Baking soda can also help keep your cat's litter box smelling more fresh, as you can sprinkle a small layer at the bottom of the litter box before you put the litter in, and it will thereby help absorb some of the odors. There are also other potential uses of baking soda. For example, if you accidentally trim your pup or kitty's nail too short and hit the quick, thereby causing some bleeding, you can dip the bleeding claw in baking soda and apply pressure. This will cause the baking soda to form a paste with the blood, and thereby help it to clot. Cornstarch, flour, and styptic powder purchased from the drug store can also be used. With all of the wonders it can work, do be sure to keep some baking soda on hand.